The Power of Pancakes – He Said What?! I hadn’t been sitting on our patio very long on this beautiful Monday morning when the door opened and there came Aaron. Remember yesterday? I wrote about happy Aaron……happy to talk and talk…..happy to eat and to try a new smoothie…….happy to watch Zookeeper……..and happy to talk and talk about Zookeeper, among other things. But this morning I saw a very different Aaron. This Aaron was disheveled and frowning and tired. Very enormously tired. His finger was wrapped in a band-aid because he had torn a large piece of skin off near his nail. And to top off his misery, he knew that Dad and I had taken the van in for some repairs. This meant that his Paradigm driver would be picking him up at home today instead of us meeting them at Quik Trip like we normally do. A change in routine on top of huge tiredness was putting Aaron on overload, and putting me on alert. 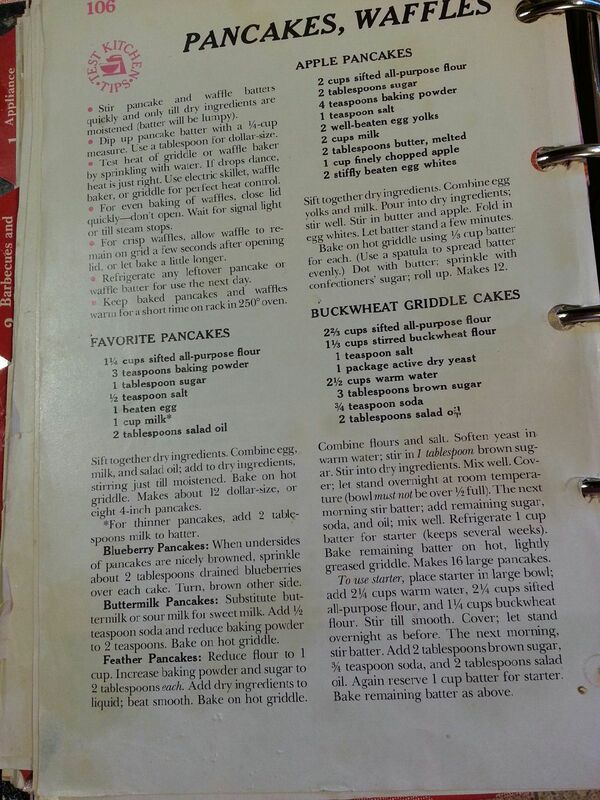 I got out the old cookbook – one that I’ve had since Gary and I got married. 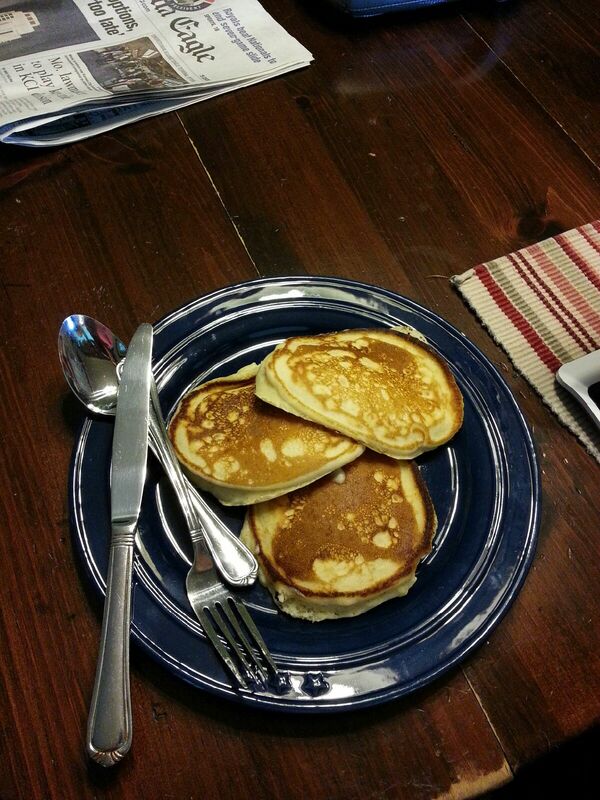 I stirred together the pancake batter as the skillet heated, and soon I had three pancakes ready for Aaron to eat. By now he was enjoying the music I was playing, and was talking away, relaxed and happy. He took the plate of pancakes to the table, along with many pieces of silverware and the napkins and toothpicks and the comics. He spied the next three pancakes that were soon ready and claimed them as well. As he saw me finish making the last pancakes, he asked if I would sit at the table with him and eat as well. I really wanted to go take my shower and get this day going, but I knew that he wanted me to stay there and so I did. I munched on a pancake and listened to Aaron talk, of course. 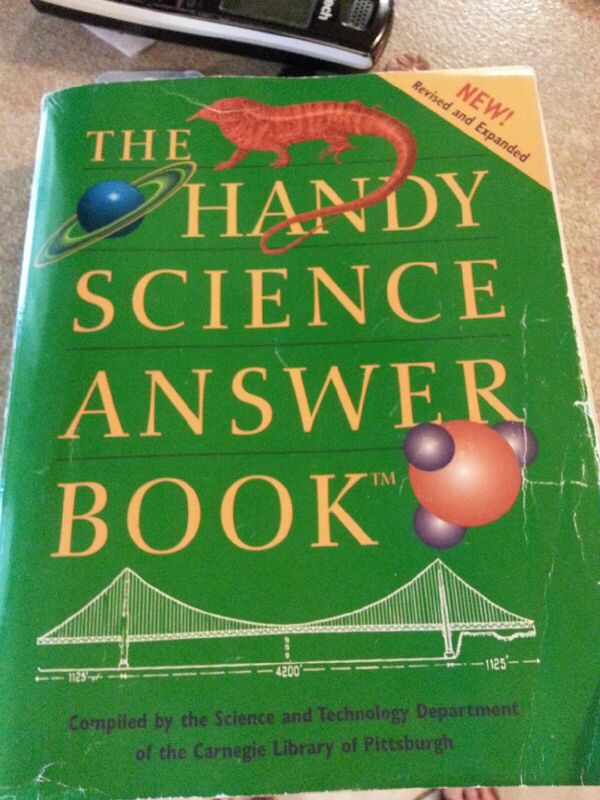 He was very excited to tell me that he had finished the chapter he was reading in his Handy Science Answer Book. “Last night I finished that one chapter and I arrived in that other chapter,” he proudly told me. He went up to his room so that he could bring the book down and show me where he had arrived in the book. He talked about numbers again, like he did yesterday, except today it was things like Pi and what it means and why it’s used……..and I suggested that he read that part of his book again instead of asking me. Aaron finished his breakfast and went upstairs to shower while I cleaned the kitchen and got the sprinklers turned on outside. After his shower, I put some medicine on his finger along with a clean band-aid. I helped him with his belt, and he asked for help with his shoes, too…….saying that his finger hurt. The morning was slipping away from me. I knew I might be in the shower when Aaron’s ride came, and knowing that he was still a little “iffy” about the ride business and the whole idea of going today, I decided to wait on my shower until Aaron left. Therefore, we sat on the front porch watching the sprinklers water our new grass seed. Aaron was happy to have my time and attention, of course, so he talked and talked…………mostly about the Zookeeper movie once again. Oh my goodness, he remembers every scene and wants to dissect every conversation and every look and every mannerism. The heat and the sound of the sprinklers and his monotone voice was driving me nearly into a state of deep sleep……..but every time I felt my eyes closing, I’d hear him saying, “Right, Mom?” I would fumble with some lame answer to a question I barely heard and he was content as he moved right on to the next sentence that had to be said. Finally, his ride came and off Aaron went. I tried to get my already late day into gear. It wasn’t going quite as I had planned. I wasn’t frustrated, really. I knew that making the pancakes and then spending time with Aaron had probably saved the day for him……..and therefore, for me in the long run. Aaron left with a full stomach and with a back rub as we had sat on the porch glider together. He was happy and said goodbye to me nicely. Time spent with Aaron is never wasted, but sometimes it’s hard to let what I want to do be put aside to do what’s best for him. Later, as I hand watered a section of our grass, I thought about how our children are like those fragile seeds that lay in the dirt. They need watering and care, even when we don’t feel like it on some days. We understand this as mothers, especially when our children are still young enough to live at home and be under our care. But when we are older, and our children are older, the watering is mostly done and we then have more time to pursue other things. Yet there I was this morning, making pancakes for my 28 year old son…….and sitting with him on the porch glider…….and rubbing his back……….and listening to his constant talking. I still have watering to do for this boy who is a man in years only. It is not another’s responsibility but is what God has given Gary and I to do. As I watered that seed, I thought of other moms that I know who are caring for grandchildren full-time…………or who are raising more than one child with special needs……..or who happily take foster children into their homes. These women amaze me! I was humbled as I thought about them and I felt very blessed to have their example to spur me on toward victory in this walk. There’s not much room for selfishness, that’s for sure. 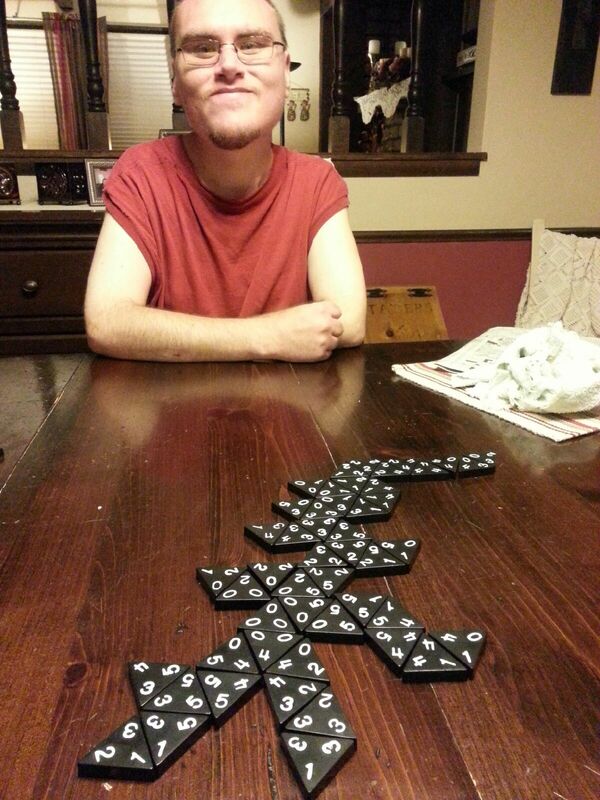 Over the weekend, I had told Aaron that we should play Tri-Ominos sometime. It’s been a long time since we played that game. He asked me to play it with him tonight. It was tempting to say no, but something made me think again………something about that seed that I had watered. And those pancakes that I had made this morning. So we played a round of Tri-Ominos tonight. It was good. He and I were content. And as I urged him later to be quiet because Dad was in bed, needing his sleep for another hard day of work tomorrow, Aaron asked me to just tickle his back for a minute as we stood by his bed. I wasn’t really wanting to do that, but I’m glad I did it. You know why? And I laughed, and Aaron didn’t mind that I laughed. He said that Barb laughed at Paradigm, too, when he told her about the Hi-yot. Which made me laugh again as Aaron stood there enjoying the back tickling. If I hadn’t been tickling Aaron’s back, I perhaps would never have heard about the Hi-yot. And I would not have had the laughter that warmed my heart and this memory that draws my heart to Aaron. No moment is wasted with our children…….not a single one. From pancakes to the Hi-yot……..it was a good day. Previous Previous post: A Million……..A Billion……. Next Next post: NEXT Labor Day? ?